Every place on Earth has weird things about it that all visitors notice but nobody really talks about, either because they're too trivial or just too... well... weird. Japan actually has a lot of little things like that, but one of the most obvious is the plastic representation of the menu outside every restaurant (including high-end ones). This is one of those things that never makes it into any travelogue but any time you talk to someone who's been to Japan you eventually end up in an "I know, right??" moment about this. It's both strangely horrifying and a little amazing how detailed and realistic these plastic replicas are. Well, now you can make them yourself! In what I think is a complete stroke of genius, there's a store in the Tokyo Skytree Town that now sells kits that allows you to replicate the oddly specific Japanese practice of creating inedible representations of restaurant food. This is apparently a tradition that dates to the Taisho era - who knew? 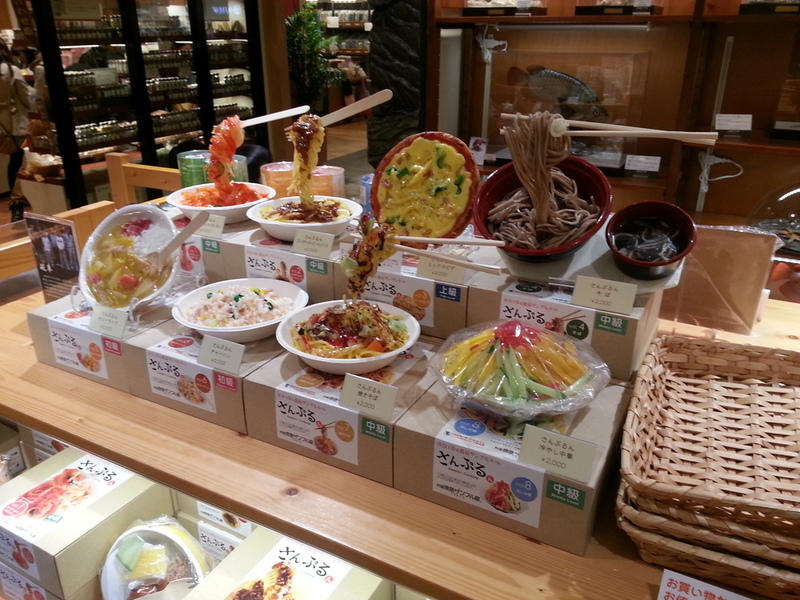 Whereas restaurants no doubt simply go to a restaurant supply store and buy pre-made dishes (perhaps created to order by skilled artisans), you can now spend $20 and up on a kit that allows you to express your own inner creativity in the medium of plastic food! I kid, but in actual fact this is one of those ideas that I'm surprised took so long to hit someone. It really is an idea that was just "out there" for the taking. Of course, I had to buy a kit. That spaghetti bowl on the top left - that had to be mine. I needed the craziest thing they had that was not completely beyond my skill level and did not cost more than $20. (And some of these things do reach up to $100 or so!). You'll notice that this is "middle level". Eh, I used to build plastic models of ships when I was a kid - how hard could a bowl of spaghetti be? This is what you get in the kit. I was surprised that it's actually wax-based, not plastic - though that does make sense. Everything is made of wax! Here you've got the raw spaghetti on the bottom left, the paper bowl, a bag full of sauce, a few bags full of toppings (green pepper, bacon, mushrooms and onion), the base, stand and fork, and both Japanese and English instructions. The box itself only comes with Japanese instructions, but the cashier at the store noticed I was western and was helpful enough to throw English instructions in the bag. First step. If you're wondering how they get the spaghetti to stand up like in that photo above, well, here's how the magic happens. The secret's out! I think I did a pretty good job with this. It already looks like a real bowl of spaghetti - maybe even moreso than when I was finally finished! To get it this way is almost like actually cooking a real bowl of spaghetti. You put the pasta in a bowl of hot water to make it soft, then wrap it around the fork and stand. For the toppings, you do the same thing so they're soft enough to cut. Then you glue them to the spaghetti. After adding the sauce, "parsley" and a gloss finish, this is my finished product. It looks pretty much like it did in the store! Yes, the color is quite intense. The instructions just recommend "gloss spray", so anything similar would work. I don't really think it's quite this realistic, but just in case, there are many warnings like this given in the box. I will say that at the end, there is kind of an odd disconnect between the way it looks and the way it smells. Especially when applying the lacquer. The cover of the Japanese instructions and the store card. Try this out! It's definitely a uniquely Japanese thing and kind of funny. 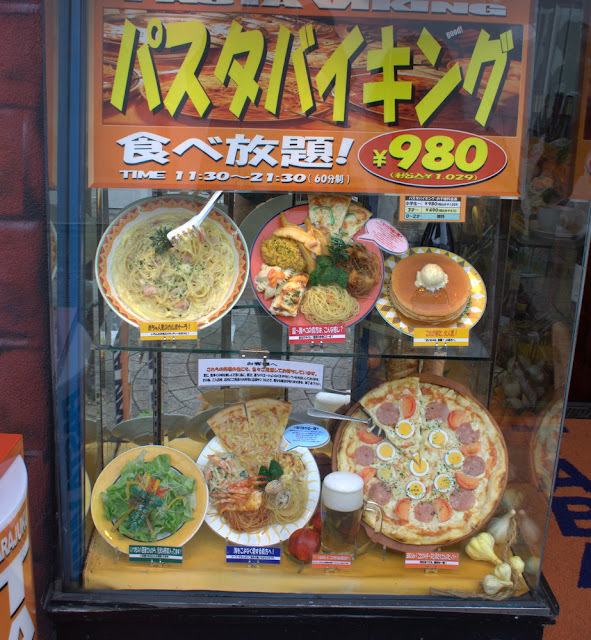 I wonder if there are people with display cases full of fake food in their houses. 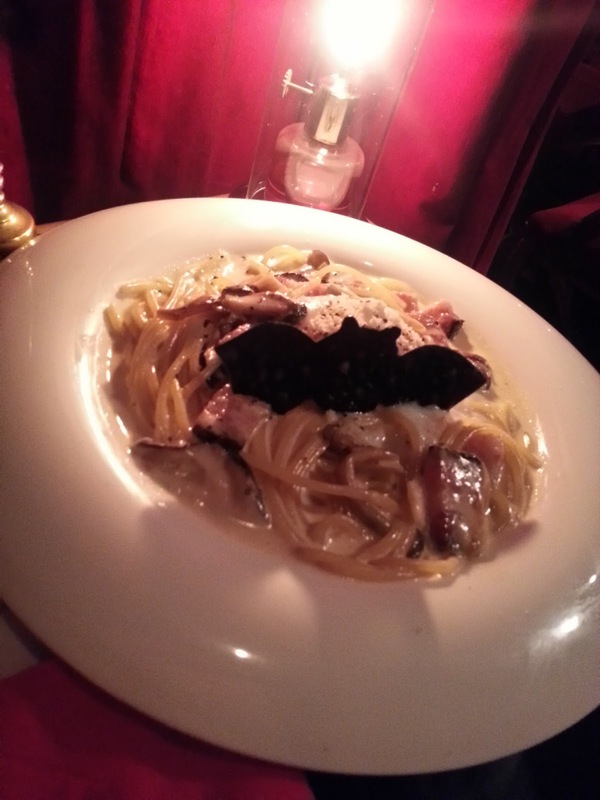 The menu is obviously specialized in pork, and you can get different cuts of it. Honestly, they're all good - I've had the tenderloin and the "regular", I don't think you can go wrong with either. This place specializes in Berkshire pork, although they have standard Japanese pork as well. The chef breads your pork right in front of you, using fresh bread crumbs the likes of which I have not previously seen. I believe they are freshly made, and they're quite large - almost more like crutons. (It's really these bread crumbs that separate this place from literally every other tonkatsu restaurant I've ever been to.) It's fun watching the chef work. This is my pork frying in a wok full of hot oil. Mmmmm, anticipation! And the finished product. A very simple dish, but one of the most satisfying you will ever have. Just freshly breaded pork, deep fried; with rice, shredded cabbage, Japanese pickles and sauces. There is also a clam-infused miso soup that seems unique to this restaurant. Everything here tastes incredibly fresh, the meat melts in your mouth, and even the sauces taste like they've been made to order. Again, it's the texture of the fried bread crumbs that really makes this place the best of the best, though - the crust ends up being light and airy in a way that no other tonkatsu restaurant I've ever eaten at could match. And here's the outside of the restaurant again, in case you need a reminder. Haneda is worth the trip as a tourist for many different reasons, but be sure to stop here any time you go. I know I will. If you're looking for an experience that's uniquely Japanese, it's hard to really top this. Nowhere else in the world that I know of can you take a tour of a major airline maintenance facility in operation - not some mothballed dilapidated hangar on the edge of an abandoned airfield (though that'd probably be pretty cool too), but an actual working facility with in-service airliners being worked on as you walk through. A bunch of our plans actually fell through on this trip, so a few nights we were looking for something to do. 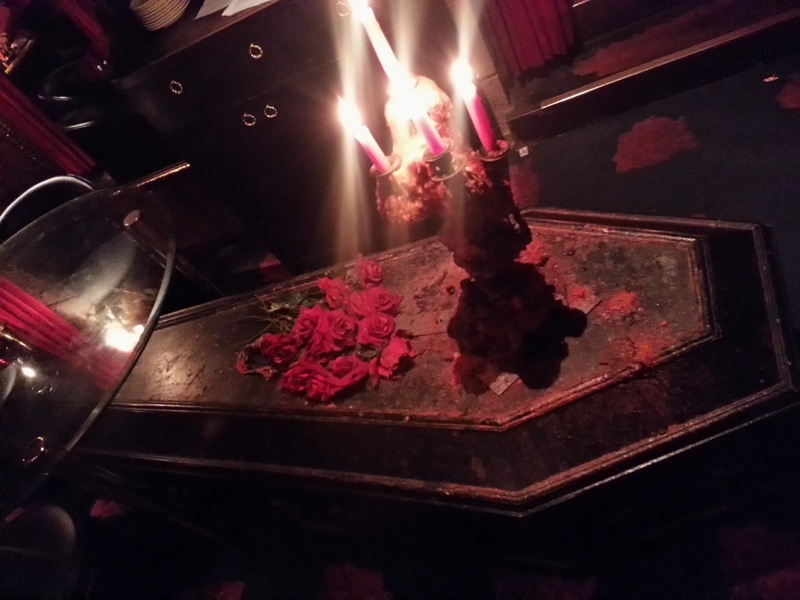 I actually Googled "unique restaurants in Tokyo" and found the Vampire Cafe on almost every list, so we decided to check it out. 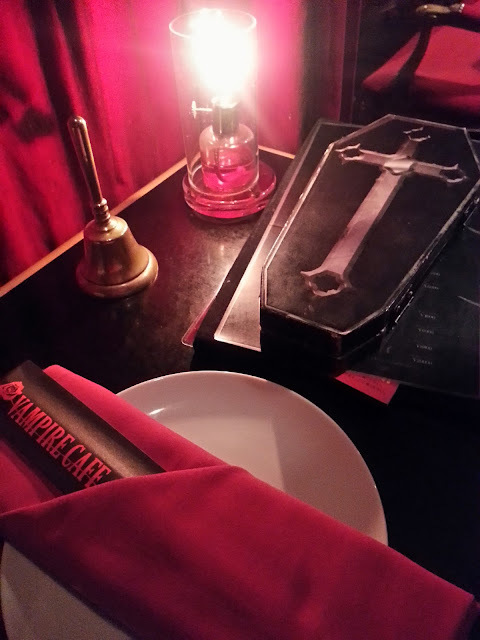 We were greeted by the guy who's probably the owner - and he was pretty gruff (but may have just been playing the "vampire" part, as he was pretty well decked out). The servers are all dressed in gothic maid outfits - my wife may have gotten a picture of one of them, but I'm still waiting for her iPhone pics. I'll update this post if I ever get them. All the food is kind of cutely gothic in presentation, in the way Japanese gothic anything is. 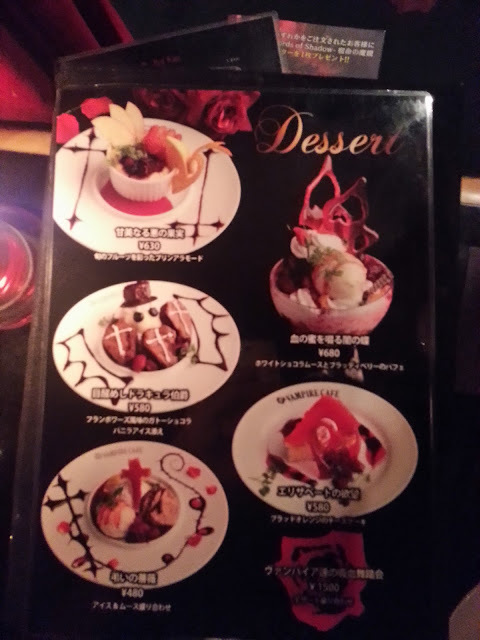 That's obviously the dessert menu - and sorry for the blurrycam, my picture taking skills were not at their best this night! Our appetizers. Coffin-shaped garlic bread, which I thought was pretty neat, and some kind of sushi thing for my wife, in the shape of a cross. 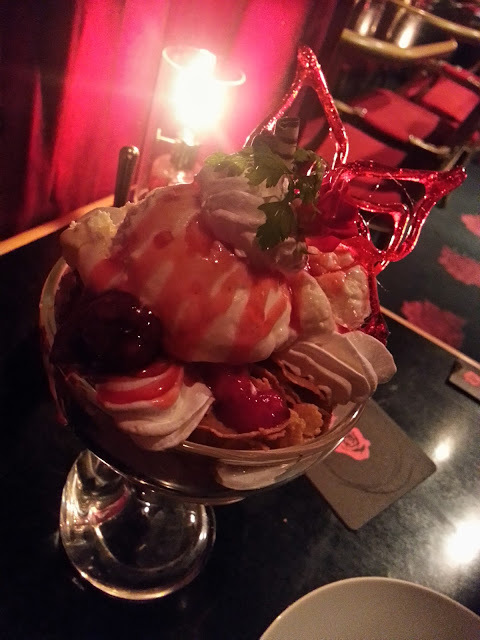 And our fairly impressive dessert, complete with sugar work. I'm actually not sure how this is supposed to be vampire themed but I guess the sauce is meant to be blood. The sugar work looks like butterfly wings, though. But it definitely looks tasty in any case. I want to eat it again just looking at the picture. We both joked about the fact that it has corn flakes in it - ever since our visit to Maid Station and its corn flake-based tiramisu, we expect that from every themed restaurant we go to in Tokyo. In this case, though, the corn flakes actually added a nice crunch to what would otherwise be a single-texture dessert. You don't really go to a place like this for the food but overall it was actually surprisingly good and not too expensive. 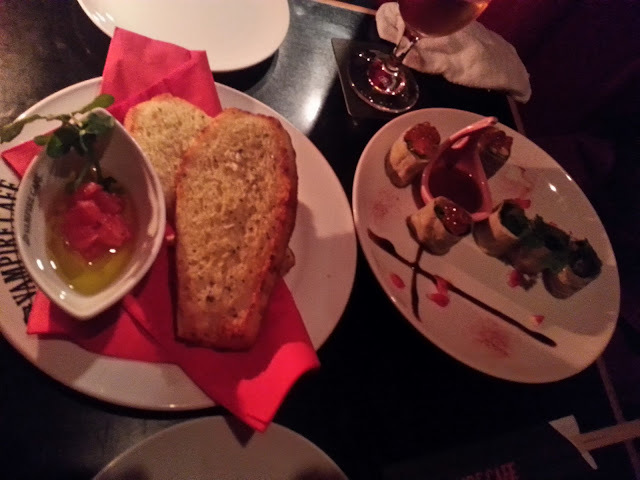 Our total bill for my wife and me was under ¥6,000 - about $60 - for everything, including drinks. I've read complaints from others about the prices but I really don't understand how you could spend $100 for two people here, unless that was in the days of 78 yen exchange rates (but then your complaint is not really with the restaurant). I feel like the atmosphere is surprisingly a little more forced, and actually a little old and ragged by Japanese standards. Also, the service was really slow - even after ringing our table bell several times, we often ended up having to just grab a waitress as she walked by. Not sure it's worth going back, but it was a fun way to kill an evening. Definitely make reservations if you plan on going - several people were turned away outright as we were waiting for our reserved table. As is probably obvious, that's a Pocket Wifi LTE. It runs on Emobile's LTE network in Japan, which is extensive - they claim it covers 94% of the country. I got it from PuPuRu. PuPuRu isn't really the cheapest or best known rental company, but they had the advantage of actually having this thing in stock at the last minute - a lot of rental companies sell out really early. Also, they have flexible rental periods; some companies charge you for either 7 or 14 days, but nothing in between. Pupuru just charges by the day, so the total price came out about average (about $10 a day). And the rental process was very easy - a package was waiting for me at my hotel, and returning it was as simple as dumping it in a mailbox right outside the security line at Narita Airport. When I first went to Japan in 2000 and up to as recently as last year, I knew that as soon as I got on the plane at JFK, I was basically going to be in internet darkness for the most part until I got back. Even hotels there have spotty internet - at most, you're still lucky to get a wired connection for free. 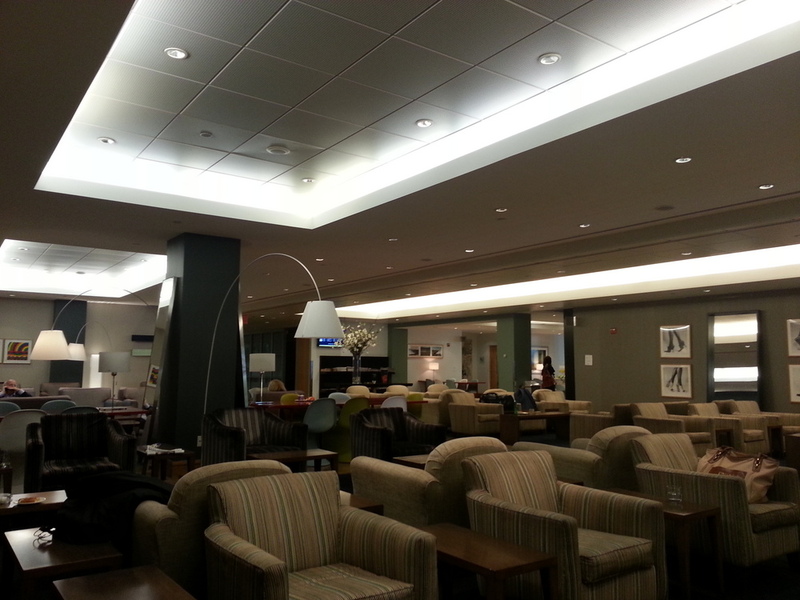 (An improvement over my first trip, when hotels there were still using dialup.) Forget about free public wifi, and a lot of American cell phones don't work in Japan. Mine does, but the roaming rates are ridiculous. I can't tell you how many times we'd get lost on every single trip to Japan - even people from Tokyo have trouble navigating the city because of its archaic addressing system. Wifi is so bad there because domestic cell phone service is so good - that's what everybody uses when they're outside anywhere. So why not just carry a device that takes advantage of that? The Pocket Wifi is a mobile hotspot, and I was able to use it everywhere - even on trains, even underground, and in Okinawa too. 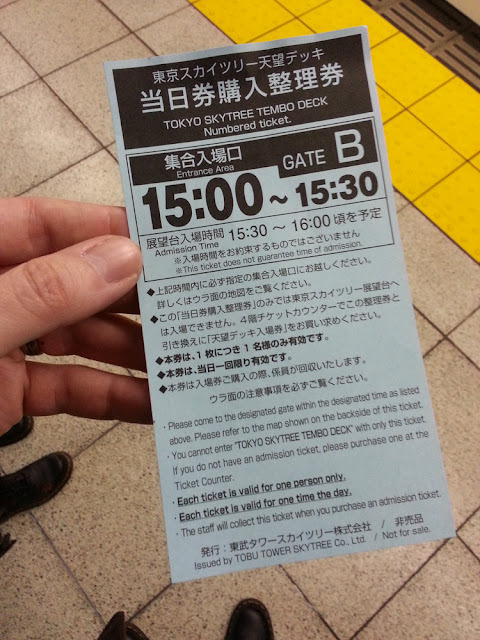 It was awesome - especially now that Google Maps supports transit directions in Tokyo. We never got lost! And we had something to do during those long, boring subway trips. I highly recommend this. One tip - get the one with the 7 hour battery, at least. And maybe rent a spare. UPDATE: Went back to Japan about 8 months later and they gave us a newer model with a 12 hour battery. And it really did last that long - except for our very longest days, we had no problem just turning it on when we went out and leaving it on until we got back to the hotel at night. So the battery issues mentioned above may already be a thing of the past - but you might want to ask when you pick it up if you're getting the 12 hour model. I previously visited the then-incomplete Tokyo Skytree last March, but it finally opened in May of last year and on this trip, we were able to take a ride to the top. 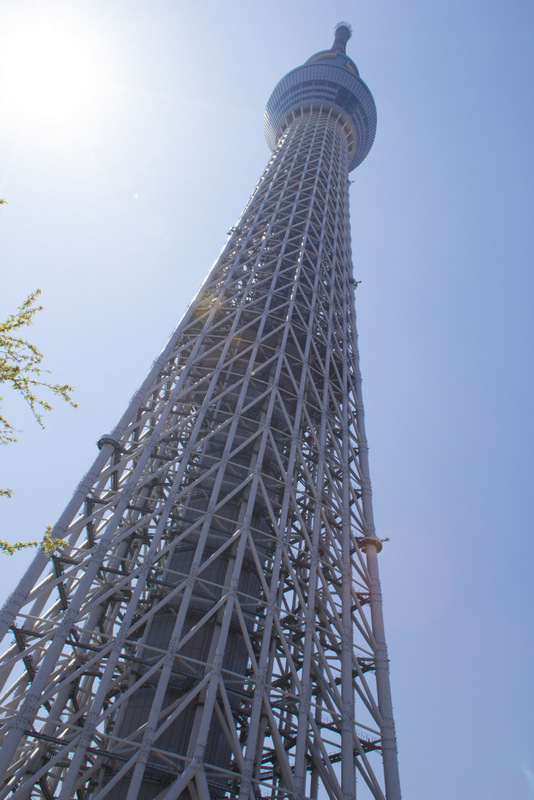 Tokyo Skytree is the most amazing tower you've probably never heard of (and the tallest in the world). Honestly, I don't really know why it's not more famous outside of Japan - within Japan, it's everywhere. We even saw a giant model of it at Charlie's Tacos in Okinawa! 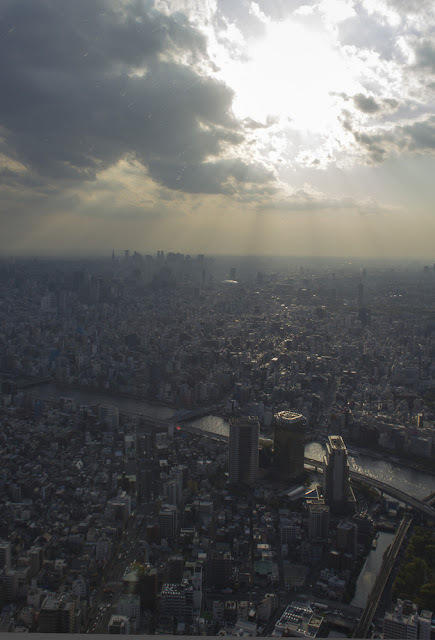 It's become the new icon of Tokyo, and it's so much taller than every other structure in the city that you can literally see it from anywhere. 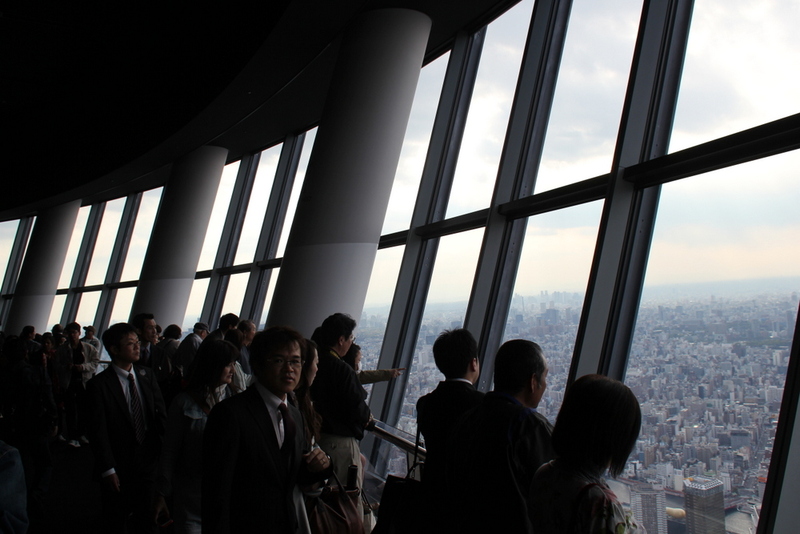 It's a new anchor point in the skyline, which is something that Tokyo has always lacked. I've seen other people complain about this, but I actually think it's pretty cool. The alternative would be waiting in line for like four hours. We got this at around noon, so we were able to hop back on the subway and do some shopping in Ochanomizu while we waited for our scheduled time. 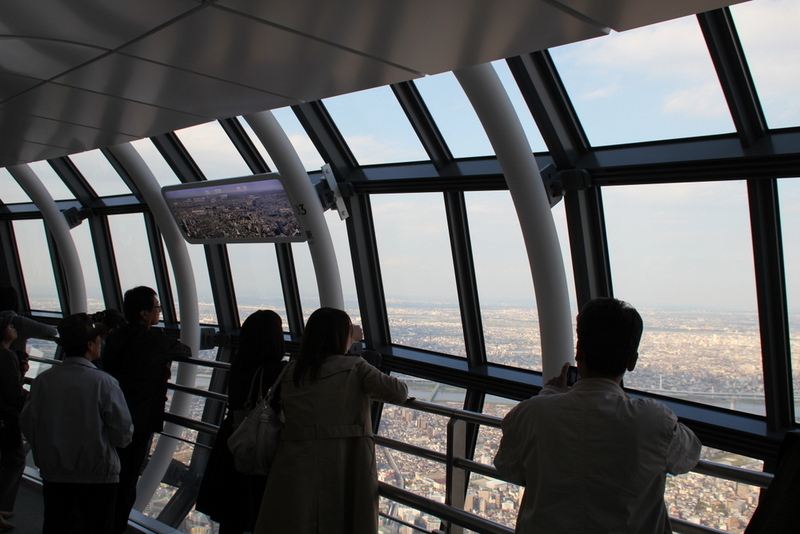 It's not like you have to sit around the Skytree twiddling your thumbs - go do something else in the meantime. This is the Tembo Deck, which is the lower deck in the pic at the top - you can tell by its shape. This is where you standard ticket takes you, which costs ¥2,000 for an adult. 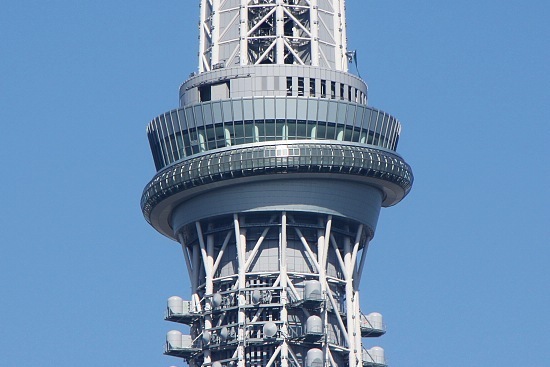 It's 350 meters high (about 1,150 feet). For some people, that's no doubt high enough. But we wanted to go all the way. 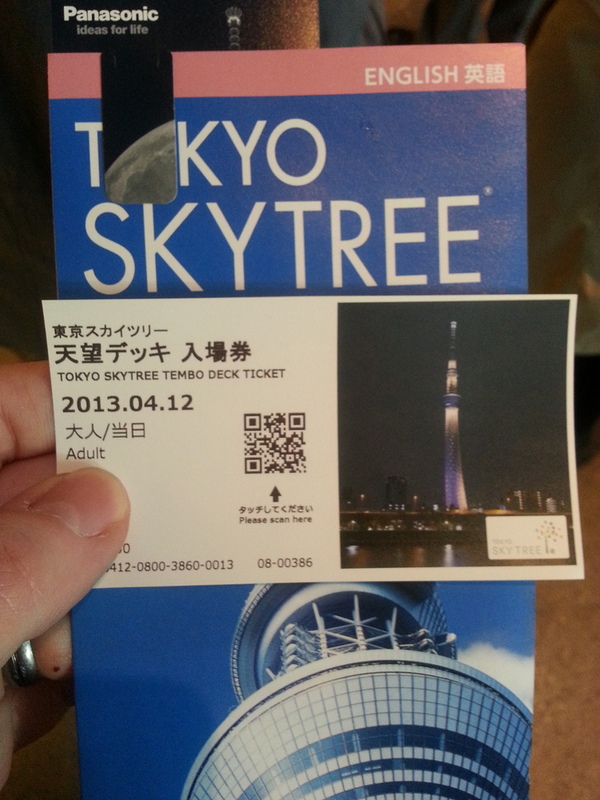 For the 450 meter high (1,476 feet) Tembo Galleria, you need to buy the ticket separately on the Tembo Deck. It costs another ¥1,000. So yeah, it's about $30 just to go as high as you can on this thing. Come on, how often are you going to be in Tokyo? Just do it. 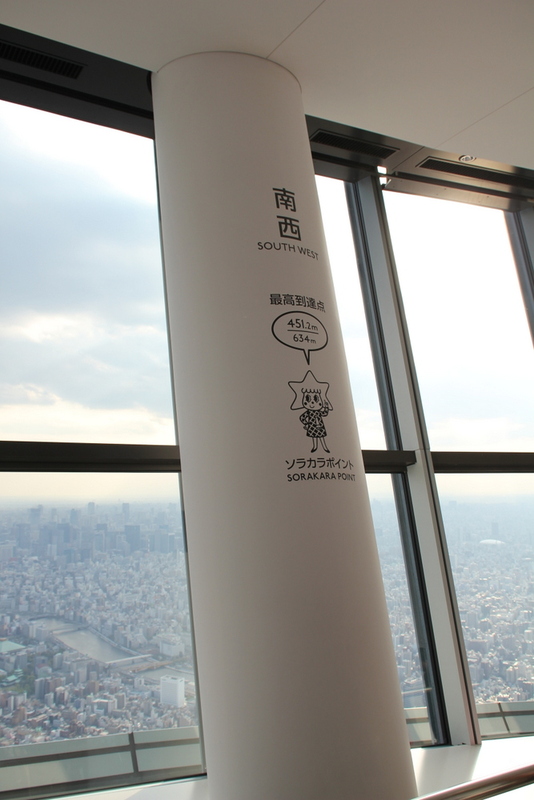 This is Sorakara Point, the highest point you can reach - 451.2 meters (1,480 feet). 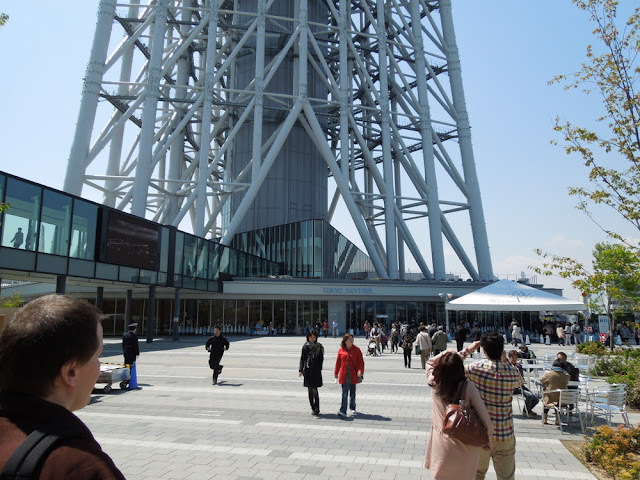 Skytree itself is much taller, but above this is just broadcast equipment. 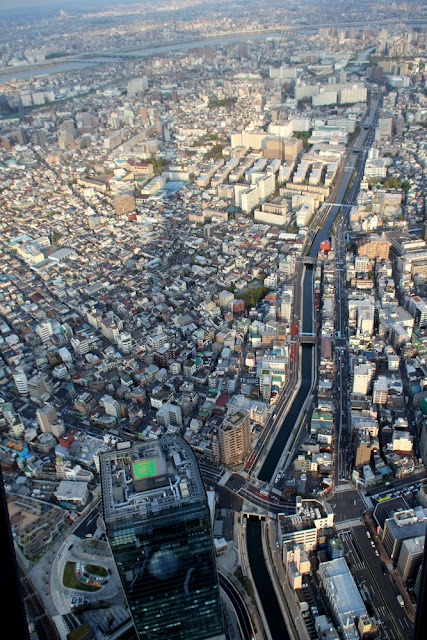 Skytree casts a long shadow... this gives you an idea of how much taller it is than surrounding buildings. After walking around the Galleria, all you can really do is head back down to the floors below. 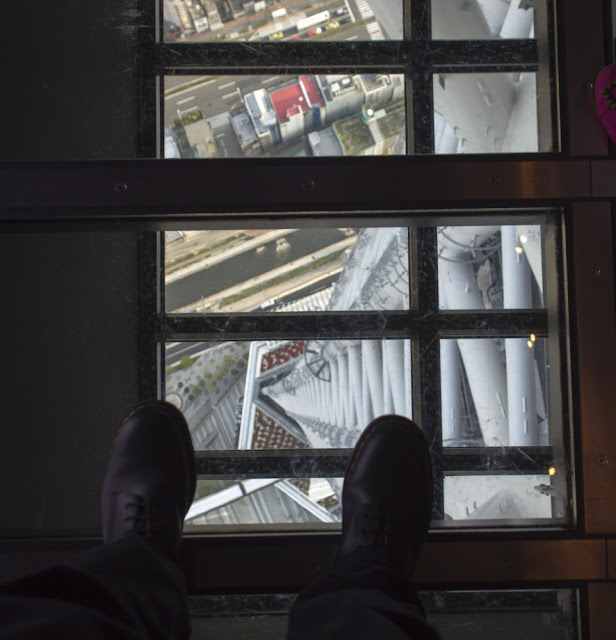 You go up from floor 350, but floors 345 and 340 have things like cafes, a restaurant, the gift shop and this straight-down glass floor. My wife was too scared to even stand on it. I may look like I'm hedging my bets a little in this photo, but I did fully stand on the glass panes afterwards. 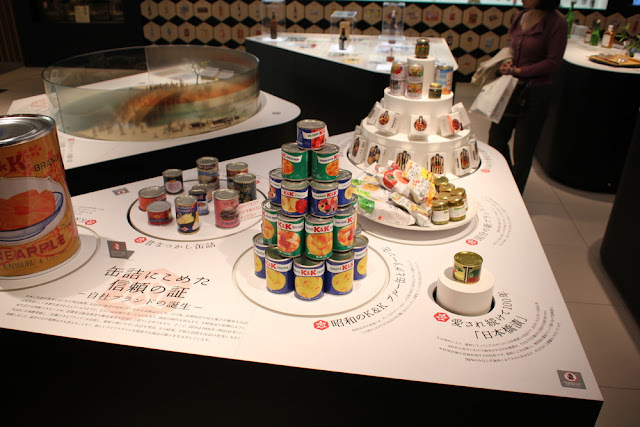 That's apparently the history of canned food. Yeah, some of the things they have down there are kind of odd and ill-advised (and deserted), but others are amazing - there is one store I'm going to write a whole post about a little later, because it's completely ridiculous but totally awesome (and I'm not going to tell you what it is yet). 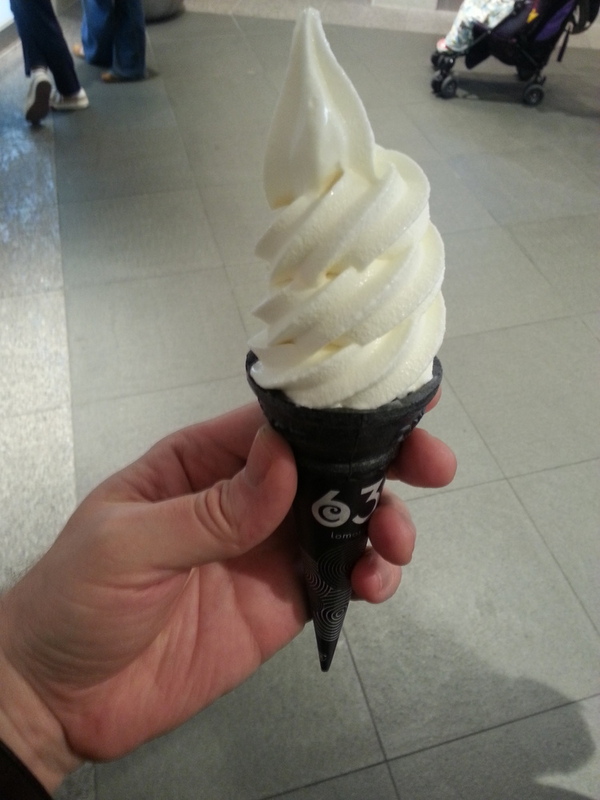 That's milk flavored ice cream and a black sesame/charcoal cone. (Yes, it said "charcoal" on the menu). And it really tasted like all of those things; it was unique, and tasty. I don't remember the name of this place but it obviously had the number "63" in it, so if you go there, just look for that somewhere on the shop guide. I recommend this. It has LED's in the base. But it is a working ballpoint pen too. Cost something like $15. There are a huge number of souvenirs you can buy there, from the obligatory cookies in the shape of Skytree, to pens, keychains and other trinkets like this, to giant, highly detailed models (some of which are about 7 feet high when complete). It's fun to just browse and look at all the Skytree-related stuff people have dreamed up to try to make money off this place.